L.A. Superior Court Judge Terry Green ruled today that the permits issued for 101 digital billboards will have to be challenged through administrative appeals, even though he threw out the 2006 lawsuit settlement that gave Clear Channel and CBS Outdoor the right to put up 840 of the electronic signs. Summit Media, the billboard company that sued to overturn the lawsuit settlement had argued that the judge should void all of the permits, but Clear Channel and CBS Outdoor lawyers countered that such an action would be fundamentally unfair. 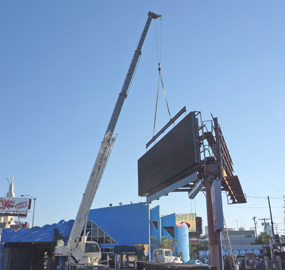 City Councilmember Paul Koretz has introduced a motion calling for the City to require all digital billboards erected as a result of the settlement to be converted back to conventional signs. Whether or not that would conflict with the judge’s ruling remains to be seen. Clear Channel and CBS Outdoor also attempted to get a temporary order restraining the city from taking any action against those signs, but that was rejected earlier this week by a federal court judge. Two homeowner’s groups, along with the Coalition to Ban Billboard Blight, filed administrative appeals in October of last year challenging the validity of permits issued for three digital billboards in the Westwood area on the grounds that they violated community zoning regulations. The Department of Building and Safety initially rejected those appeals, and further appeals were filed with the city planning department. A zoning administrator conducted a public hearing on the issue in June of this year, but to date no report of findings has been issued, more than a year after the first appeals were filed.